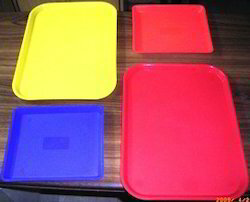 size 10"x8") is specially designed for fast food chains, restaurants & motels. Its unique design enables it to be stacked easily. The anti-skid design within the tray does not allow the items to spill or fall. Bakers Shop is engaged in providing its customers an exclusive range of Anti Skid Tray for their applicability. Our offered range of Anti Skid Tray is supreme in quality and is highly durable. They are available in different sizes such as small, medium or large. Godskitchen’s Anti-Skid Bar Trays are a must needed product for all restaurants, hotels and even homes. It is very useful for serving during parties, or other crowded events as it prevents the glasses to slip and fall. Size: 12" X 16"/ 14" X 18"/ 15" X 20"/ 16" X 22"
Rectangle Anti Skid Tray, Size: 12x16" And 14x18"